There are times when a lousy memory comes in handy. When watching a movie I’ve seen before, for instance, it can be like watching it for the first time again! I’m still moved-surprised-delighted-shocked by the action on the screen and twists in the plot because I’ve forgotten many of those details from the previous viewing. The same thing happens this time every year. I get a knock on the door from the UPS guy, he hands me a package that says “perishable: refrigerate immediately” and wonder to myself what that could be. It’s my annual Valentine’s Day bouquet from an admirer. I blush a little bit thinking about the treats he sends. And I start scheming exactly how I’m going to use that endive. Six or eight years ago at a conference I met a gentleman from California Vegetable Specialties, folks down in Rio Vista, California who devote themselves to growing, and teaching us about, endive. 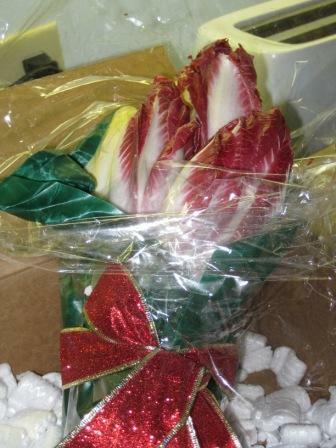 I guess I impressed upon him my longtime love of endive, because not a year goes by now that I don’t receive the Valentine’s Day delivery. I struggle with referring to endive as a type of “lettuce,” though by strict definition–a garden vegetable with edible leaves–it is. And since one of endive’s most common uses is as a salad ingredient, the association is natural. 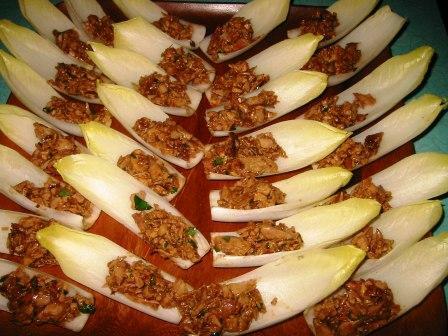 But one reason I’m so enamored of endive is its sheer versatility, so much beyond any other member of the lettuce clan. Starting simple, the first thing I did with a few heads of this year’s delivery was one of my all-time favorite salads, one I’ve mentioned at least a few times in the past: sliced endive, chopped toasted nuts (walnuts or hazelnuts) and crumbled blue cheese tossed with a red wine vinaigrette (preferably made with walnut or hazelnut oil). And last night I simply halved 3 or 4 heads and cut out the tough (and bitter!) core, leaving the heads together as much as possible. 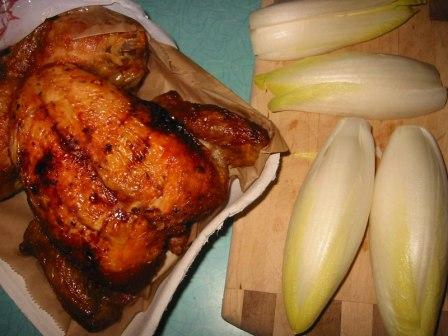 A couple tablespoons of butter melted in the skillet, I added the endive cut side down and browned gently a few minutes, then poured in some white vermouth, topped loosely with a piece of foil and reduced the heat to lightly braise them until the vermouth was evaporated and the endive was tender. 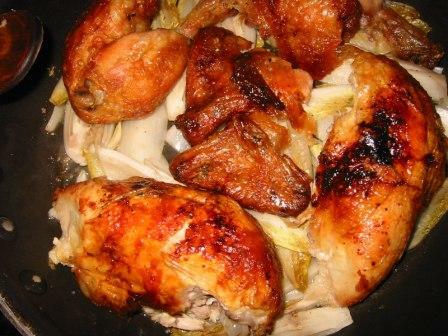 This is a preparation in which many folks would sprinkle in a bit of sugar to counterpoint the bitterness and contribute a touch of caramelized-browning. But we like them au naturelle. And I’m a big proponent of endive leaves as one of the very best edible containers going. For a cocktail party, buffet, any party setting for which finger food is on the menu, nothing beats foods that you can pick up, pop in your mouth and leave no dishes or utensils for cleaning up later. A host’s dream dish! Oh, and speaking of game night (which I’ll be doing a lot here soon, since my new book Gourmet Game Night is being released in a couple of weeks), endive leaves are one of the best ways to serve your guests an elegant, flavorful dish that won’t distract at all from the Scrabble tiles or poker cards or Cranium clay. In that book, I chose to embellish the endive with a simple salmon poke (diced raw salmon tossed with soy, sesame oil, cilantro and slivered red onion). Digging around my photo files, I found this image of the leaves topped with a duck mixture of some kind, I’m afraid that lousy memory leaves me at a loss about details of that preparation. But shows just how diverse uses for endive can be. One of the most decadent uses I know of for endive is gratin d’endive, or endive à l’ardennaise as Anne Willan cites the recipe in her timeless book French Regional Cooking. The whole heads are first braised until mostly tender. Then each is wrapped in a thin slice of ham and arranged in a gratin dish, topped with lush béchamel sauce, topped with gruyère cheese and baked until bubbly, hot and nicely browned on top. A simple salad alongside, and you’ve got a wonderful wintry way to serve delicious endive. 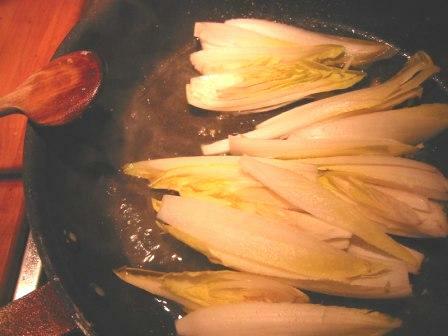 I totally ♥ endive. And though I use it often throughout the year, always feel an extra attraction this time of year thanks to my annual delivery on my doorstop.